Chitrakoot, nestled in Bundelkhand region, is a charismatic land of cultural, spiritual and historical significance to the folks traveling from every nook and corner of the world. It is a town where the past is pleasingly treasured in its colorful divine centers, while the serene rivers, peaceful woods and miraculous sights together make it a highly visited place in Madhya Pradesh, India. An illustrious place of superb fairy-tale significance, Chitrakoot imitates the quintessence of Hindu lifestyle. Fiestas and fairs in this holy town have a spiritual façade and it is geared up to eulogize the charm of Lord Rama with its different fairs. Ram Lila is the most legendary festival of Chitrakoot, held during the last week of February. People in abundance pay a visit during the festival of Mahashivratri to view the presentation of Ramayana. According to the great epic Ramayana, God Rama stayed here with his consort Sita and younger brother Lakshman for 11 years out of the 14 years of his exile. Some of the famous sages like Dattatreya, Sarbhanga, Markandeya, Atri and many other soothsayers, pilgrims and philosophers have carried out meditation here. The triad of Brahma, Vishnu and Mahesh embodied the great sage Dattatreya also revered as 'Lord Dattatreya' for the triad in one body. Also known as 'Hills of Many Wonders', different scriptures of ancient times have recounted the rich holiness of this pious place in a beautiful way. Valmiki addresses Chitrakoot in shining words as a great devout destination colonized by the great philosophers and many other sorts of plants and wildlife creatures. The celebrated poet Kalidas has depicted this amiable place in his epic Raghuvanshi. Not only these, several other Sanskrit and Hindi writers have paid homage to this holy town. An exceptional experience in one of the beautiful wonders on earth in a pleasant and soothing ambience, Chitrakoot tenders to its visitors. Hanuman Dhara: Amongst the popular sites of Chitrakoot, Hanuman Dhara is situated at a distance of 2 miles from Ramghat in the superb backdrop of wooded mountains. The devotees will be amazed by the lovely ambience that surrounds them. Devoted to Lord Hanuman, it bestows a picture of an amiable legend of Lord Rama. Sati Anusuya Temple: Amid the dense forest lies Sati Anusuya Temple where one can relish the chirping of the forest birds, along with the serene setting of a consecrated premise. It has countless myths of Anasuya the companion of Sri Maharshi and mother of Dattatreya, whose respect and devotion towards him gave her huge strength. Ganesh Bagh: About 4 miles from Chitrakoot, Ganesh Bagh is one of the highly visited gardens here. Constructed by Peshwa King-Vinayak Rao during the 19th century, it is known for its beautiful carvings and structural works of an ancient time. 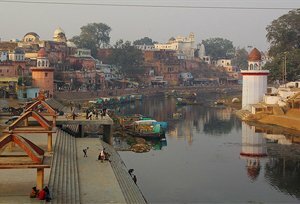 Janaki Kund: A destination where Sita took a bath during the time of exile is Janaki Kund, nestled 2 km from Ramghat in Chitrakoot. Enclosed by lustrous greenery, this sacred Kund is the perfect place to spend a relaxed time with your closest ones. One will undoubtedly be amazed by the serene surroundings of the place. Kamtaji Temple: Addressed to Lord Rama, Kamtaji Temple is placed in the beautiful setting of a wooded mountain by the name of Kamadgiri. 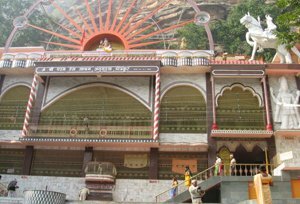 Sphatik Shila: One of the scenic landmarks in Chitrakoot, Sphatik Shila is a place where Lord Rama and Goddess Sita admired the exquisiteness of this place. Mandakini River flows nearby where one can easily spot the colorful fishes moving in water. One can feel the freshness of the untouched Mother Nature in the tranquil location. By Air: The nearest airport is Khajuraho to Chitrakoot, about 185 km away. Taxi facility is available from there to make it to the desired place. By Rail: Chitrakoot is well connected to the main cities of Madhya Pradesh and many other parts of India by trains. The nearest railhead is at Chitrakoot Dham, which is situated 5 miles from the town. By Road: The town is connected with all legendary cities of the country by excellent roads. Frequent bus services are available to Jhansi, Varanasi, Chhatarpur, Agra, Allahabad and some more.